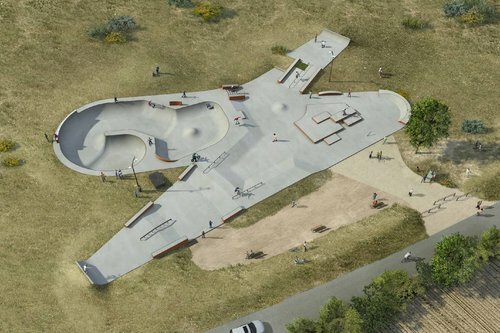 After a lot of uncertainties, a new skate park will soon pop-up in the municipal district of Petit Plan, near Draguignan. Short of beautiful work, since that sports complex boasts an ideal situation: rather eccentric but a step away from downtown. The stadium Gilly had also been chosen last year for the first sketch of this project. Initially, the land, which belonged to the urban community Dracénoise, was donated to the city. The skate park and had to land on a plot of 2400 m2 - 60 m long by 40 wide - and accommodate several modules slides. "The only problem is, the plot was to undergo a major disbursement. And our budget is not elastic, "said the deputy. 80% of this budget, one hundred thousand euros, was swallowed up in the formatting of the field. Hence the idea to wait and hope for a significantly more funding. Strong advocate of this achievement, but faced with the management of flood damage in June 2010, the mayor, Max Piselli, also waited. Then found funding more appropriate to this achievement. Profitable strategy since a few months, the budget has almost quadrupled. It reached 370,000 euros! The tender, to find a company that specializes in the release, was launched. And the case assigned to a Marseilles company, Constructo architecture, one of five specialists in France. Jean-Bernard Miglioli has also approached technical Dracénois. And not least: Franck Eyriey, president of the Union and Core Skate Abrate Roman, who is none other than the champion of France of freestyle skating. The professional athlete is currently ranked 3rd in the world! Brief as the heavy. Work will be launched in June and end in September. After the disbursement phase, the concrete will be poured into the mold of 1270 m2 natural X-shaped having recesses of 1.20 m to over 2 meters. Several modules are well made and slides open to practitioners of skateboarding, inline skating and BMX. Modules available at all levels and the school. "The idea is to allow multiple activities simultaneously. There will be no fence, but baffles to prevent entry to scooters, "says Jean-Bernard Miglioli. The structure will be lit for evening events, benches installed. Around the skate, there will be grass. And hopefully, many.